Not welcome at British government Cabinet meetings. Photo by Bill Juoy on Flickr. • All the ostensible defendants ostensibly agreed to injunctions being issued against them, which often leads to a very quick court order (in some cases, less than a week). • Of these 25-odd cases, 15 give the addresses of the defendants — but a private investigator (Giles Miller of Lynx Insights & Investigations) couldn’t find a single one of the ostensible defendants at the ostensible address. This turns out to be quite weird, and seems to be about the lack of a “right to be forgotten” in the US. But are the same tactics being used in the UK, or Europe? A year and a half ago, I took a new job at a legacy publisher — a well known brand name with a strong readership. They hadn’t put a lot of stock in social media strategy and even in 2015, had a mere 167,000 Facebook fans and got only a fraction of traffic from the platform to the website. I was determined to change this. I took on the Facebook platform with gusto, getting ads into play, overhauling the posting strategy, doing A/B testing, getting our well-known writers fan pages, mixing up content, adding video to the list, aggressively targeting new fans and adding share buttons and social incentives to everything we did. Literally within days, the Facebook traffic increased. Month after month, the platform engagement grew, our fan base exploded, our traffic increased significantly from Facebook. And then, the algorithm. The stupid algorithm. The algorithm that every social media manager has come to loathe with the fire of thousand suns. I can assure you, our content is not the problem. Several months back, our traffic from Facebook plateaued. Then it tanked. Now, the traffic is as low as it was before I arrived. You know, back when they had 800,000 fewer fans? How, in god’s name, is this even possible? *I understand that Facebook can do whatever they want. They can prioritize friends and family postings above publishers if they want to. That’s fine! But, if publishers are investing large amounts of money in building their fan bases — getting people to like the page that are actually the kind of people who want this kind of content — isn’t there some kind of ethical obligation on their part to deliver the content provided? Ministers have been barred from wearing Apple Watches during Cabinet meetings amid concerns that they could be hacked by Russian spies, The Telegraph has learned. Under David Cameron, several cabinet ministers wore the smart watches, including Michael Gove, the former Justice Secretary. However, under Theresa May ministers have been barred from wearing them amid concerns that they could be used by hackers as listening devices. Mobile phones have already been barred from the Cabinet because of similar concerns. Mr Gove disrupted one Cabinet meeting when he was Chief Whip by inadvertently playing a Beyonce song. Dominiczak is the political editor. I can imagine this came from a corridor conversation with a minister. Only need now to narrow it down to those in the Cabinet who wear Watches. Can believe they’d be a hacking target, though. They have a microphone; why not? Lionel Shriver’s book “The Mandibles” (highly recommended) has a passing mention in the plot setup of a time when the whole of the US’s internet is knocked offline for some time. Here’s hoping she’s not prophetic. Chinese site Weibo has picked up some leaked images of the alleged HTC watch, codenamed Halfbeak, a codename which has been associated with the watch before. The images have since been shared by TechTastic.nl. The images show an almost customary circular watch face with a reported 360×360 pixel resolution but what isn’t clear is what the face is made from, but it’s likely to be metal. 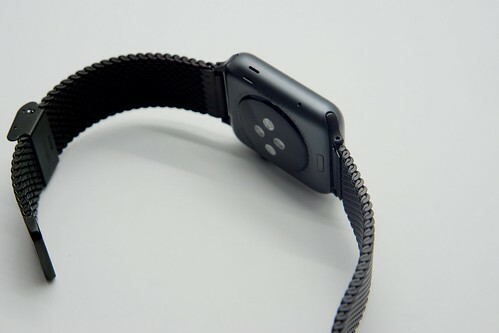 The strap, which on first impressions doesn’t look interchangeable, appears to be made from rubber silicone. The watch will run on Android Wear and control will be via two round buttons and a longer oblong button on the right hand side of the face. It’s likely HTC’s smartwatch will be aimed at fitness fanatics, as there’s a clear Under Armour logo on the back of the watch, confirming a partnership between the two companies. There also appears to be a heart rate monitor on the underside of the watch too. Great way to lose money, but hey, let HTC decide for itself how it digs its grave. The justices’ ruling, due by the end of June, could have a long-term impact for designers and product manufacturers going forward because the Supreme Court, if it agrees with Samsung, could limit the penalties for swiping a patented design. Samsung Electronic paid Apple $548.2m last December, fulfilling part of its liability stemming from a 2012 verdict for infringing Apple’s iPhone patents and copying its look. But Samsung will argue before the Supreme Court that it should not have had to make as much as $399m of that payout for infringement of three patented designs on the iPhone’s rounded-corner front face, its bezel and the colorful grid of icons that represent programs and applications. It will be the Supreme Court’s first case involving design patents in more than 120 years, when the products at issue were carpets and rugs. Cupertino, California-based Apple sued its South Korean rival in 2011, claiming Samsung stole its technology and the iPhone’s trademarked appearance. Samsung has said it should not have had to fork over all of its profits on phones that infringed the patents, which contributed only marginally to a complex product with thousands of patented features. Apple has said Samsung was properly penalized for ripping off its work. Guess a decision there would qualify for a “Finally” if ever one did. If you own a Samsung Galaxy Note 7 you should immediately stop using it and return it for a refund — all the major US carriers will exchange the phone, regardless of purchase date. We don’t know why Samsung hasn’t been more forthcoming about what’s going on with these replacement devices, but it doesn’t really matter. Until we get more information, the simplest explanation is the best one: the Samsung Galaxy Note 7 is a fundamentally defective product and it should be pulled from the market without delay. Given these troubling reports about the Galaxy Note 7 replacement devices, Business Insider reached out to the company to ask if it still believes the phones are safe for customers to use and charge. The answer? Yes. Not reassured. And sure enough, after this story appeared, Samsung announced that it was stopping all sales and exchanges while it investigates, and told everyone to turn off and exchange their Note 7s. It isn’t a surprise that we will access technology by voice. More surprising will be how people work alongside, and develop affection for, these computers. At Amazon, that has led to rethinking Alexa’s purpose. Sensing that many users want a companion, Amazon is giving Alexa a personality, by making its voice sound more natural, and writing clever or funny answers to common questions. “A lot of work on the team goes into how to make Alexa the likable person people want to have in their homes,” says Mr. Gill. Google, too, has been working to make its voice interface, and the artificial intelligence behind it, personable. Last week the company rolled out Google Home, an Echo-like device powered by Google Assistant, its version of Alexa. But people have been talking to phones, tablets and computers powered by Google software, which has among the best voice recognition in the industry, for years. As his interviewees say, when there’s no interface except the voice – no pointers, no touch objects – you’d better do it like the humans do. What makes a Nobel Prize winner? There’s several suggested factors: Perseverance? Good luck? Good mentors and students? Here’s one possible factor that I would have never imagined in my wildest dreams; chocolate consumption. Chocolate consumption tracks well with the number of Nobel Laureates produced by a country. At least that’s what a paper published in the New England Journal of Medicine – one of the world’s premier journals of medical research – claims. I have to say I found the study bizarre when I read it, and a few hours of strenuous, perplexed thought have done nothing to shake that feeling off. Don’t worry, the writer points to the more obvious underlying factor after a bit. Nanyang Yongkang Medicine’s story [threatening to sack employees who got an iPhone 7] was soon picked up by a local news website. It reported that when it contacted the company to check the story a company spokesman called Mr Liu confirmed that the warning was issued on behalf of the firm’s chairman. He said it was intended to encourage staff to pay more attention to their family instead of luxury goods. Mr Liu’s boss is not the only employer who professes to be concerned that the iPhone 7 could lead their workers to developing an unhealthy obsession with pricey technology. This week Weibo users have shared photos of a notice issued by the Fuling Xinjiuzhou Gynecology Hospital in Chongqing warning its staff not acquire an Apple habit. It reads: “iPhone 7 has recently come onto the market and the price is a record high among the similar mobiles. In order to promote thrift and avoid waste, the hospital administration office has made a decision: we ban our staff from buying iPhone 7s.” The notice goes on to warn that anybody who flouts the rule will be disqualified from receiving the top grade in their staff appraisal and will be urged to return their phone to the shop. The hospital’s manager told BBC Trending he had been prompted to act when a member of staff had bought an iPhone 7 even though it cost three times their monthly wage. Make China Great Again. Bring The Jobs Back. Something like that.